Two large agricultural companies started legal action against the European Union. This because the EU decided to temporaly ban the use of three insecticides linked to a decline in bee populations. What are the most efficient health care systems in the world? Some infographics with an overview. The Paraguayan government has extended their “Zero Deforestation Law” for a further five years. The Land Conversion Moratorium for the Atlantic Forest of Paraguay, also known as the “Zero Deforestation Law” was enacted in 2004 and dramatically slowed the country’s deforestation rate by prohibiting the transformation and conversion of forested areas in Paraguay's eastern region. The situation at the Fukushima Daiichi nuclear power plant is not under control. Radiation levels 18 times higher than previously reported have been found near a water storage tank at the Fukushima Daiichi nuclear power plant, causing fresh concerns about the safety of the wrecked facility. Japan will spend up to $500 million of public funds to tackle radioactive water leaks at Fukushima as the government vowed to take the lead in the clean-up. There is a possibility to reduce the amount of greenhouse gas emissions from agriculture through the use of a modified tropical grass. Brachiaria grasses have been found to inhibit the release of nitrous oxide, which has a more powerful warming effect than carbon dioxide or methane. The chief executive of Lenovo Group Ltd. is sharing his annual bonus with his staff. Yang Yuanqing, will share $3.25 million from his bonus with some 10,000 staff in China and 19 other countries. The world's corruption index is out. The Index is based on expert assessments and data from 13 surveys from independent institutions, covering issues such as access to information, bribery of public officials, kickbacks in public procurement, and the enforcement of anti-corruption laws. A Chinese delivery company is testing a drone to deliver packages to remote areas. The drone can hit an maximum altitude of 100 meters (328 feet) and deliver parcels within two meters of its target. Research showed that people seem to save more energy when they know they’re being watched. According to the research, people who received a postcard telling them their electricity usage was being tracked for one month reduced their electricity consumption by an average of 2.7 percent. A study has found that in music can strengthen the heart - and improve the recovery of patients suffering from heart disease. Cardiologists said the findings suggested that all people could boost the health of their hearts simply by listening to music. South Korea's Tower Infinity will be world's first "invisible" tower. It uses cameras and LED projectors to blend into the background. A floating garden allows farmers to grow food on flooded land. The garden patches are built using water hyacinth, which is collected to construct a floating raft. This is covered with soil and cow dung, in which vegetables can be planted. A creative solution to the smog problem in Hong Kong in relation with tourism. Hong Kong´s scenic bay is now so hazy that tourists who visit can pose in front of a printed background instead. Interesting developments in Detroit. The bankrupt city is renewing itself with sustainable business. The Femen organisation, who's protesters use their breasts as a canvas for their slogans, was founded and is controlled by a man. In an incredibly rare twist of fate, a married couple in the UK have had their marriage annulled after discovering that they were in fact twins separated at birth. 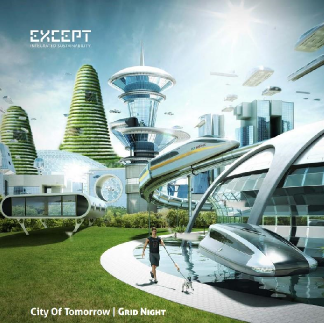 We’re happy to invite you to the Except Grid Night, a mind nurturing evening about the City of Tomorrow. We will tickle, challenge and inspire you with future urban scenarios concerning food, living and working. The goal is to liberate your inspiration and open doors for more sustainable projects. Where? Beurs van Berlage, Oudebrugsteeg 9. No entrance fee after registration. This bi-weekly digest is assembled from items sent to us by Except members. Have questions, comments, or news items to suggest? E-mail merel.segers@except.nl. Read past Wormfood global news reports here.